Since 1945 the UN has failed to prevent 162 wars and the proliferation of nuclear weapons, and there is talk of a Third World War involving the Middle East, the Baltic states and North Korea. Competing nation-states seem powerless to achieve world peace under the UN. Continuing a tradition that began with the 1945 atomic bombs, Nicholas Hagger follows Truman, Einstein, Churchill, Eisenhower, Gandhi, Russell, J.F. Kennedy and Gorbachev in calling for a democratic, partly-federal World State with sufficient authority to abolish war, enforce disarmament, combat famine, disease and poverty, and solve the world’s financial and environmental problems. In World State Hagger sets out the historical background and the failure of the current political order of nation-states. He presents the ideal World State – its seven federal goals, its structure and the benefits it would bring – and sets out a manifesto that would turn the UN General Assembly into an elected lower house of a democratic World State. He details the constituencies for a World Parliamentary Assembly and World Senate, and provides the data for his calculations in full appendices. A companion volume contains a Constitution for a ‘United Federation of the World’ that can be laid before the UN General Assembly. This comprehensive and authoritative study serves as an introduction to this Constitution and may come to be seen as the defining work on a World State. NICHOLAS HAGGER is the author of 46 books that include works within history, philosophy, literature — and international politics and statecraft. In 2016 he was awarded the Gusi Peace Prize for Literature, as he describes in Peace for our Time (also published by O-Books). 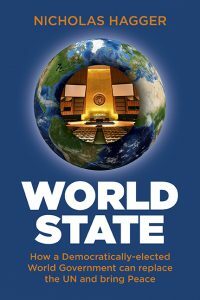 World State will appeal to all who are looking beyond the nation-state to a partly-federal World State that can bring in universal peace, prosperity and a safer world.